We all need something to hold on to – a kernel of hope. Mine happened to come in the shape of a boybander. Having looked up to A.J. throughout his Backstreet Boys career, wishing I could have the guts, drive and energy to follow my dreams like he’s done, you might say I was a liiiittle excited when he released his first solo album a few years ago. The title track, Have It All, quickly became my anthem. Have a listen, and I’ll share below why this song means so much to me! (I’ve also included the full lyrics below). Live and let die and you will have it all. I tattooed the words on my body and kept them in my Heart. When you don’t have a reliable source of safety within, you need to find it externally. My inner sense of security was definitely missing, or fleeting at best. I desperately needed something to hold on to. Interpreting the lyrics over and over, finding new meaning at each listen, the song revealed itself as a small yet mighty Light in the Dark that helped me reframe the pieces of my broken life into a coherent story I could accept. Live and let die… What do I want to live for, and what do I want to let die? I’ve asked myself this question so many times. What parts of me will I give room to live and grow, which parts will I confront and let die? What do I want to keep in my life and what do I wish to get rid of? I do believe I am working towards «having it all» – inner peace, self-love, self-worth, stability and happiness within myself. By nurturing my inner world to become a place of joy and well-being, I hope and believe that the positive changes will filter through me and affect my outside world as well. The more I work on myself and become comfortable in my own skin, the more I realise who I truly am and what I value. Everybody walks alone, they feel like they don’t belong. I never felt like I fitted in, so this sentence resonated with the part of me that identified as the odd one out. But as the lyrics say, everybody walks alone. Everyone is on their own journey, everyone has to find their own answers. And in that sense, I am not alone. Turning it around from negative, «I feel like I don’t belong», to positive, «this is MY personal journey and therefore my responsibility», I discovered empowerment and freedom. ‘Cause if my journey is my responsibility – which I now can acknowledge it is – then I also have the power to shape it the way I want it to be. Don’t know where you going, but you know where you stand. A few years ago, I didn’t even know where I stood. Didn’t know who I was or who I wanted to be. Didn’t know what was wrong, why I felt miserable or how to address the situation. But by asking the tough questions, I now know where I stand. I still don’t know exactly where I’m going, but at least the road is opening up ahead. Blocks are removed. As for knowing where I’m going: One day I will know! And I don’t doubt that anymore. I’ll try my best to enjoy the ride while finding out. Some people let it in, while others let the moments pass them by. I used to be really afraid to speak my mind, to be judged. The more important the issue was for me, the harder it was to speak the words that mattered. Nowadays I try my best not to let moments pass me by, but to speak my mind and grab opportunities that come my way. Perhaps most importantly, I figured out how to know when I was having a «moment». Whereas I earlier would have taken that nervous little flutter in my chest as a sign to shut up, I now know it means the exact opposite – speak your mind! Be truthful. Be direct. Manifest your thoughts into words. That little flutter tells you you’re having a moment in which to actually LIVE. Speak. Act. Always a reminder when I look in the mirror. The words that have guided me in the right direction. Meeting your idol is kind of a big deal! Do you have a life motto? Do you live by it? Who or what inspired it? 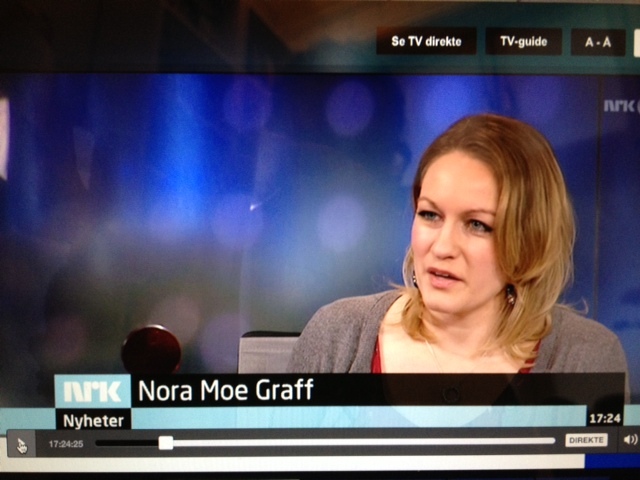 Fredag den 12. april fikk jeg æren av å være gjest på NRK Morgennytt. Jeg var invitert for å snakke om hvordan det er å være en stor fan av noen. Det ble en kjempefin og artig opplevelse, selv om jeg så klart var litt nervøs før jeg skulle på lufta. Dette var min første gang på TV live og som intervjuobjekt, og det er noe ganske annet enn å stille som statist i en produksjon eller delta i diverse opptak. Men da jeg først satt i stolen for grilling, så gikk minuttene veldig fort! Jeg hadde så mye mer jeg kunne ha sagt, men det får komme enten her på bloggen eller dersom det skulle by seg andre anledninger. Intervjuet kan sees her. 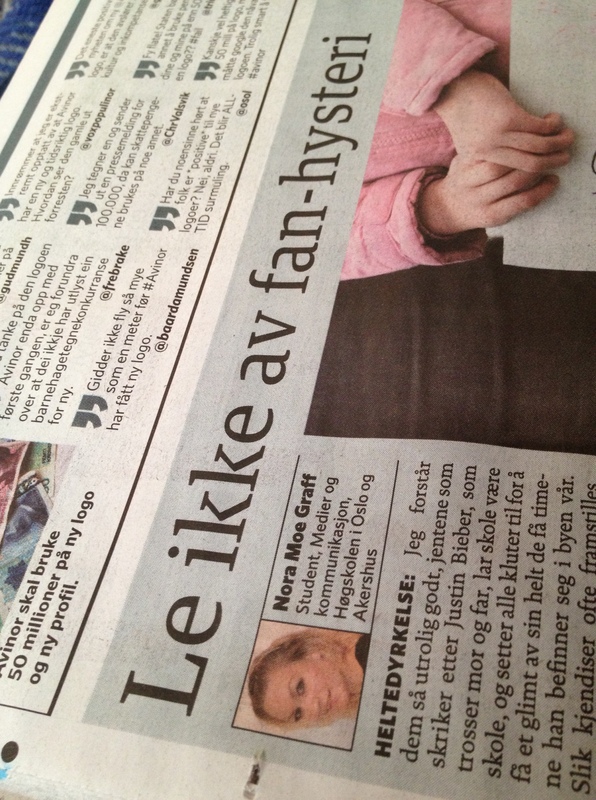 Videre ble jeg intervjuet av Sissel Hoffengh fra Dagsavisen i hennes sak om beliebers, Jakten på Justin. Her fikk jeg med et par av poengene det ikke ble tid til på Morgennytt, men jeg kan trygt si at jeg har mer på lager! I dag har vært en begivenhetsrik dag for meg med innlegg på trykk i Dagbladet. Jeg synes det er svært interessant og ikke minst viktig å se litt nærmere på hva som rører seg i skjæringspunktet mellom popkultur og psykisk helse. Den tilsynelatende galskapen kan si mer om ungdommens livssituasjon enn ungdommen selv. I hvert fall hvis de intense følelsene vedvarer år etter år.